Lync/S4B Client Can Normalize Numbers with Plus Sign?!?!? "Lync/Skype for Business will not attempt to normalize a number that already has a plus sign at the beginning"
There are signs that this is no longer true, at least for customers running Skype for Business Server 2015 and the Skype for Business 2016 client (and even the Lync 2010 client). I was messing around with normalization rules last night and realized that my Skype for Business 2016 client (version 16.0.7030.1021 32-bit) WAS normalizing numbers that started with a plus sign. I later validated this with a Lync 2010 client against the same Skype for Business 2016 server. And a commenter below said he's pretty sure he did this with Lync Server 2013. So this means that either it has ALWAYS worked this way and I never realized it, or its something relatively new on the server-side. This DOES NOT mean that the Skype for Business client will suddenly normalize all numbers that start with a plus. If your normalization rules do not include a plus sign, it will not normalize a number with a plus sign. This has all sorts of ramifications, all of them positive. That means that dealing with improperly formatted click-to-dial numbers in Internet Explorer is much simpler. We can now fix this with a simple normalization rule, instead of doing it in a trunk translation rule or route. This also means that dialing contact phone numbers from Outlook can also be much more reliable, especially if an extension is entered. Before, if a user entered a contact phone number with an extension in Outlook using the "Phone number builder", it would format the number like "+1 (212) 555-1212 x 345". If you clicked this number, Lync would parse the "x" as a "9" and the number would come out in Lync like "+121255512129345" and would likely fail. I have no idea how long this new behaviour has been available. It works on a Skype for Business Server 2015 environment with both Skype for Business 2016 clients and Lync 2010 clients. I don't have a Lync 2013 or older environment to test with. I tried to see if this behaviour extended to server-side normalization scenarios with no luck. I tried to change the destination phone number on an incoming call that started with a plus sign. It didn't work, which implies that this is a client-only thing. The MSPL workaround is still required. If this is only new to me, then I apologize for wasting everybody's time. I've incorporated my new findings into the Lync Optimizer (as you would expect), because it does allow for several dialing scenarios to work better than before. If anybody has any information on this or can test other versions of Lync server/client, drop me a line. UPDATE (2016-Aug-24): Updated to clarify that a normalization rule has to explicitly look for a plus sign for this to work. Original post implied that any valid, matching normalization rule would be applied to a number that had a plus sign on the front. Also made changes based on further observations with older clients. Almost every country in the world has a dedicated country code assigned to it for telephony purposes (see countrycode.org for a full list). There is one very large exception to this rule and that is countries in North America (US and Canada) and a good portion of the Caribbean. These countries all share the same country code of +1 and are collectively part of the North American Numbering Plan (NANP), which is managed by the North American Numbering Plan Association (NANPA). A NANP number consists of the country code +1, a 3-digit area code, and a 7-digit subscriber number, often formatted like +1 (212) 222-3333. You'll sometimes see the +1 omitted from the number on business cards and websites that don't think globally. Dialing numbers in North America is quite different from most places in the world. In the rest of the world, if you want to dial a long-distance or national number, you have to dial a national access code. In a lot of countries, this number is 0. However, in NANP countries, you have to dial 1 for long-distance/national numbers. That's right, you have to dial the actual NANP country code as the long-distance access code, which is unique among all other countries. Incidentally, the international access code is 011 (in many other countries, its 00). "Connect me with the German Chancellor immediately! I have an idea for a new album!" If you want to dial Canada from the US, or the US from Canada, or any of the Caribbean countries in NANP, you don't dial the international access code 011, you just dial the number as you would any other long-distance number. So, if I want to dial Toronto, Canada from Vancouver, Canada I would dial +1 416 555 1111. If I wanted to dial New York City from Vancouver, I'd dial +1 212 555 1111. It gets even better. NANP area codes are allocated by a trio of over-caffeinated spider monkeys who press numbers on a giant keypad at random to assign a new area code (well, that's how it appears). There is no logical separation between area codes between any of the countries. For example, area code 646 is in New York, USA, 647 is in Ontario, Canada, and 649 is in the Turks & Caicos (Caribbean island nation). Click here for a current list of area code allocations in NANP. These days, calls between the US and Canada are often priced identically to a domestic long-distance call. But calls to the NANP Caribbean countries are usually priced much higher, akin to dialing some very remote international destinations. 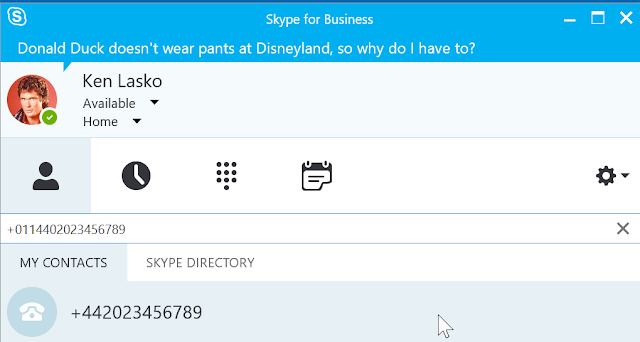 Continuing the previous example, a US user that has signed up for Microsoft's Skype for Business Online PSTN Calling Plan can expect to pay $0.013 per minute (just over 1 cent a minute) to call area code 647 in Ontario, but would end up paying $0.583 (almost 45x more expensive) to $0.741 per minute to call area code 649 in the Turks & Caicos. Since it is nigh impossible for a regular person to distinguish a Caribbean country from US/Canada based solely on the area code, it is easy for people to accidentally incur high phone charges when calling these countries. 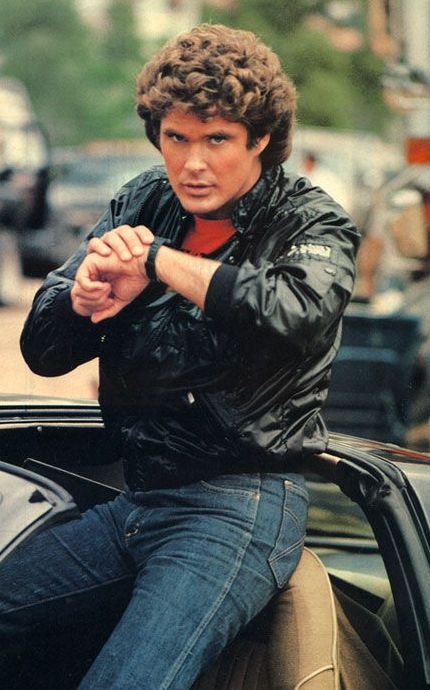 He had an Apple watch long before anybody else. 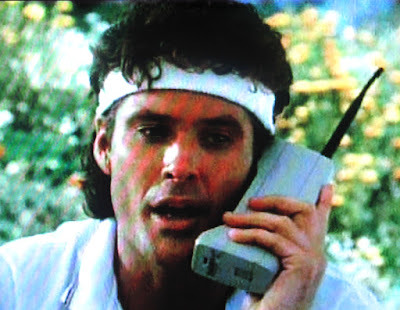 True trendsetter, even if it took 30 years. Skype for Business administrators often want to prevent certain users from dialing these Caribbean countries, and it can be easily done with some fancy routing rules. Assuming you've already configured voice polices for national and international access, then you just have to modify the National level voice route to block Caribbean destinations. You could do some research to determine the Caribbean area codes, and create your own regular expression to block them, but I figure I should do SOMETHING useful with this post and provide you with that information. You may note that I've also made sure to exclude premium area codes like 900 and 976. In-Country Only - Treat all calls to NANP countries other than your own as international, even though users don't have to dial 011 to reach them. As such, users will have to be a member of a voice policy that allows international dialing. Selecting the Simple Ruleset option prevents usage of this feature, and will default to US/Canada/Caribbean. You won't be able to control how people dial other NANP countries when there is only a single simple routing rule. So, there you go. A lesson in the finer details of dialing numbers in North America that the rest of the world might not be aware of. Try to contain your excitement.